You are cordially invited to join hundreds of other Magic the Gathering fans on Saturday &/or Sunday, September 29 &/or 30, 2018 for our GIANT PHILADELPHIA-TRENTON AREA MAGIC GGUILDS OF RAVNICA PRERELEASE WEEKEND events! These are the latest of many officially sanctioned Magic tournaments that we host in the enormous OXFORD VALLEY MALL COMMUNITY ROOM. This venue allows us to spread out & enjoy the game more than ever before, with large tables & lots of comfortable seats. We've been running large Magic the Gathering events in this great venue for years now - so please come attend our professionally-run prerelease event(s) in grand style! Saturday & Sunday, September 29 &/or 30, 2018 in the Community Room! Attend Saturday &/or Sunday! Save $5 by buying combo tickets! Saturday & Sunday Morning Main Events start promptly at 10:00 AM. Community Room opens at 9:00 AM. RESERVE YOUR SPOT & GUILD NOW! FIRST COME - FIRST SERVED! We are offering players a chance to not only reserve their spot(s) in the event(s), but also grab their Guild(s) of choice! Just stop by our store, choose your Guild and prepay for the event. There will be an equal number of each Guild made available, and once a Guild is "filled", it will be closed. events BOTH DAYS!!! (Saturday at 3:00, Sunday at 2:00; 4 rounds only! Entry $55 per team). Events will conclude no later than 9:00 PM. *Please be on time, otherwise you risk forfeiting the first round of the event. adjacent to the main entrance & the big outdoor water fountain, next to the public restrooms. Easy directions will be given when you buy tickets at All-Stars Collectibles or by clicking the FIND US link above! Tickets: Tickets cost $30 per player per sealed event, or purchase a combo ticket (Sat & Sun Main Events) for $55. Two-Headed Giant events are $55/team. Tickets can be purchased at our All-Stars Collectibles retail location on the outside of Oxford Valley Mall (cash or charge) prior to the event, or at the Community Room (cash only) the day of event. Tickets are available NOW & right up to the big events We will open our store's doors at 8:30 AM on the event days for last-minute ticket sales. Register early to not miss any events! Click here for store location & hours. 1) We will be offering you the opportunity to participate in a whole weekend of Guilds of Ravnica prerelease fun! Each Main Event ticket will get you a special Prerelease Package containing a rare or mythic rare *Guild-Specific* Promo Card (, a spindown life counter & more, plus 6 Boosters with which to build your deck. One of your 6 boosters will be Guild-Specific! On Saturday at 3 pm & Sundays at 2 pm we'll be firing our Two-Headed Giant Events. THG costs $55 per two-man team, and registration starts one hour prior. You get to play with the new cards from this exciting set for hours - nobody gets eliminated until the events are over or you quit to start another! Like all All-Stars' Magic Tournaments, the prize pool will be HUGE with additional Guilds of Ravnica boosters going to all that make the top16! 4) We will be raffling off a Guilds of Ravnica booster box & other MTG goodies at the event, chances are only $5 each & the box will be available for pickup at our GUILDS OF RAVNICA LAUNCH PARTY on October 5th in our retail store! Raffle Tickets will be available both days of the event, drawings take place Sunday. Winners need not be present, inquire at the event for details. Imagine scoring a whole box of Guilds of Ravnica for only $5!!! It happens at all of our Prerelease weekends! 5) A chance to win over 50 door prizes just for attending! *All participants must have a valid DCI Number at time of registration. Don't have one? No sweat! We'll give you one when you sign up free of charge! Special Guilds of Ravnica Promotion !!! 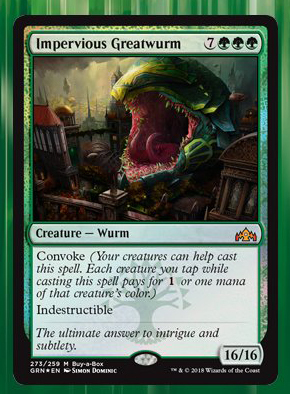 Preorder a Booster Box of Guilds of Ravnica with All-Stars Collectibles, and not only can you pick them up at our Giant Prerelease Weekend events, A WEEK EARLY, but we'll give you this awesome Foil "Impervious Greatwurm" Buy-A-Box Card! It's the biggest creature ever made (non un-set), it's part of the set & not available in packs or anywhere else - only through this promotion!